The thinking behind Keen.io is pretty simple: No one should have to build their own analytics infrastructure, especially not mobile developers. It’s a long, hard, complex process that’s only made more difficult in an era where developers want to track a lot more metrics than just pageviews. 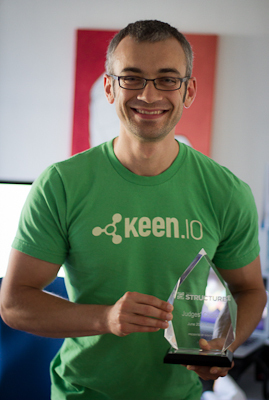 So Keen built an analytics infrastructure for them — well enough to win over the judges at GigaOM’s Structure Launchpad competition on Wednesday. According to Co-founder and CEO Kyle Wild, mobile developers are an underserved market when it comes to analytics. They don’t necessarily have the tools to build analytics platform in the first place, but there aren’t many places they can turn for products that will do the jobs they require in an analytics product. Whereas there are plenty of web 1.0-style products for tracking pageviews, Wild said, mobile apps need a way to track everything from subscribers to clicks to how many times an app was opened and closed. With just a line of code written into the app, Keen lets developers track whatever they want. It relies on “APIs to get data in and intelligence out,” Wild explained. Users just have to write a program to let them query and visualize the data Keen has captured — or work it into the mobile app itself — and they’re rolling in mobile analytics data. Although Keen doesn’t run Hadoop or any traditional big data tools as part of its infrastructure (yet), the service does allow for some complex analytics. Wild described one customer that built a white-label iPad (s aapl) app for the medical-device-sales industry, which salespeople use to show their wares to potential clients. Among the many ways sales teams use data from the app is to analyze which procedures or devices the top sellers demonstrate first. Currently in private beta, Wild said Keen has big plans coming up, including building its own visualization layer and exiting from private beta into a freemium business model. Although enterprise developers will likely always be Keen’s revenue-generating users, Wild said the company’s advisers have pushed the importance of building a strong developer base in order to attract mindshare, improve the product and, perhaps most importantly, spur bottom-up adoption of Keen by their employers a la New Relic. Spraetz noted the company also faces an upcoming challenge, although it’s one most startups would kill to have: Although Keen currently runs on dedicated infrastructure in SoftLayer’s cloud, it keeps racking up cloud computing credits on other platforms such as Rackspace (s rax) and Amazon Web Services (s amzn) as it makes its way through programs such as TechStars, and it has has to think of some creative ways to use them. Spraetz photo courtesy of Keen.io/Michelle Wetzler.